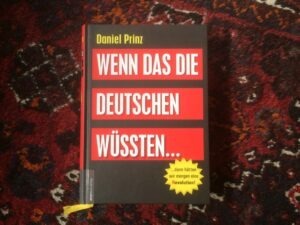 WENN DAS DIE DEUTSCHEN WÜSSTEN… …dann hätten wir morgen eine (R)evolution! An inconvenient truth! Banks and Church. Why does God need a middleman? Daniel Prinz shines a light on how business interest comes first and people last. If I could trace my lineage back to German descent before 1914, I could apply for a ‘Gelbe Schein’ to claim my sovereignty. The Dutch movement of Souverein Mens van Vlees and Bloed knows how to claim it in the Netherlands. You are enslaved too because people are registered worldwide as business items. Ever wondered why your NAME IN CAPITALS when dealing with the government and banks? Is the church an organized crime organization that exists to use and abuse you? Keep in mind the use of negatives always leaves you remembering that one word because you forget about the denial. ‘Don’t think of a lemon’ makes you … ‘think of a lemon’. Take out the ‘not’ after the ‘thy shall’ of the Ten Commandments and see what remains. Well written, researched and clearly, and constructively put together this book offers an insight into the true horrors of the world, as well as providing solutions on how to deal with it. Be brave!